ACTRA Toronto President Theresa Tova reads Performers Online in her office. Let me address the second question first. I am extremely proud of the work our writers, editorial committee, staff, photographers and designers have put into publishing each and every edition of our printed magazine and newsletter. Together we have produced award-winning issues. 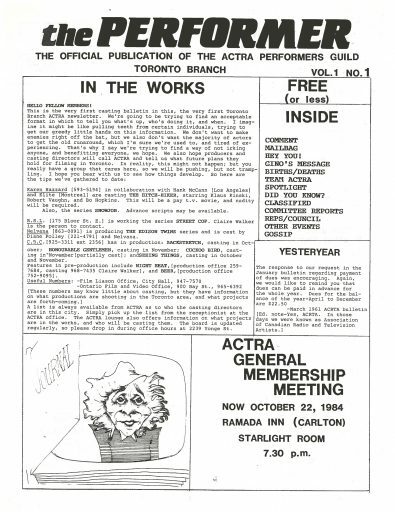 That said, during my tenure as publisher of Performers, members have approached me and other councillors questioning why, in this age of depleting natural resources and environmental concerns, we are still producing a paper magazine. Change comes slowly but we listened. To remain relevant, we are charged with contemplating where the printed magazine and indeed all communications are headed. We must be “advancing toward what will be.” And digital is it. The statistics on digital magazines are compelling. The OMDC (Ontario Media Development Corporation) reported that digital magazine readership in Canada grew to reach a monthly audience of 8.5 million as of the first quarter of 2017. Notably, Magazines Canada revealed “of the over 8 million Millennials in Canada, 41% are using a smartphone to read magazines. Social media is the conduit that leads 59% of Millennials to magazine content.” For many, online is all they read. Performers Online’s time has come. As for how Performers Online will be different, here are a few questions and answers the editorial staff and I thought would help readers better understand, navigate and drive the new Performers Online. 1. What are the benefits to Performers Online? To begin with, Performers Online is much less expensive and far more portable. You can read it on your device. The blogging model allows us to post ACTRA Toronto-related content without the time delay of printed publications and with no limitations on space. Actors have lots to say and the industry in which we work is complicated. Also, publishing online is far more environmentally-friendly: no trees, no ink, no mail trucks. 2. What’s in Performers Online? 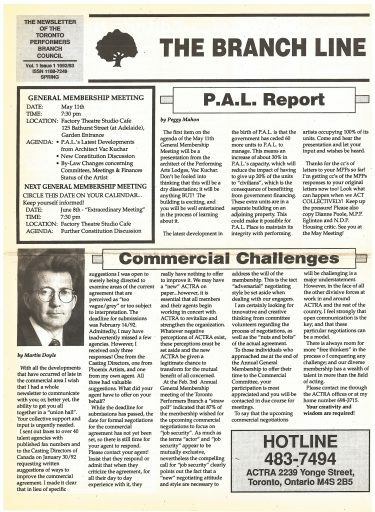 Like our print publications, we aim to include helpful, motivating pieces and clear, informative content relevant to a professional, unionized performer, including messages from the president, articles from committees, union business, articles about the business of performing and industry explainers. 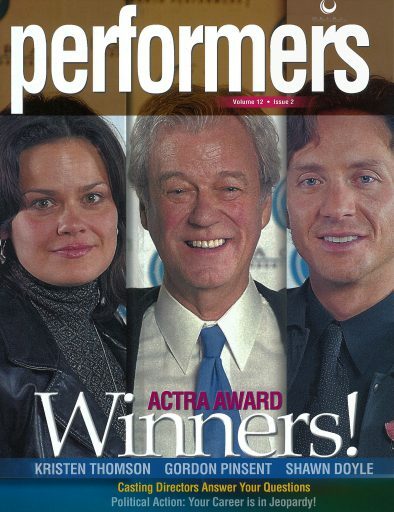 Plus, union videos and photo galleries from our numerous ACTRA Toronto events. 3. How will I know when new content has been posted? There are several ways to keep informed about what’s new on Performers Online. The simplest way is to subscribe to the RSS feed. If you are an ACTRA Toronto member, we will periodically let you know by e-blast when you can click through to new, important content, or we’ll announce the posting of new content on our Facebook page, or via our Twitter or Instagram accounts. 4. How do I navigate the site? All articles are posted on the home page in chronological order, with the newest articles at the top. All articles are tagged, so if you are looking for an article on diversity, for example, click on the “diversity” tag on the right-hand side of the page (or type “diversity” in the search field) and all articles tagged diversity will come up in the search. If you prefer, you can click on the tab of your choice. 5. Who can write for Performers Online? Any ACTRA Toronto member or staff member may submit content for Performers Online. Send your pitch or article to editor@actratoronto.com. All ideas will be considered by the Editorial Board. If you are sending a pitch and we are unfamiliar with your writing, we will ask you for a writing sample. If the article is approved, it will be edited by one of our editors. We will ask you for a short bio and a photo to accompany the piece. Writers receive a small honorarium per published word. We cannot guarantee your piece will be published. An outline of the process and the Board’s expectations is emailed to writers. If you are interested, please email us and we will forward it to you. 6. Can I say whatever I want? 7. Who can read it? Anyone. Like almost all websites, if you can find it, you can read it. Producers can read it. Casting Directors can read it. Agents can read it. Fans can read it. Therefore style, grammar, and the wisdom to say things that demonstrate solidarity with your fellow union performers are more critical than ever. 8. What type of content are you looking for? In general, we are looking for information that is of interest to the membership as a whole, expressed in a third person reportage style. Your personal journey is likely better suited to your website. 9. Can I post obituaries and remembrances here? Obituaries are housed on our regular website here. Submit an obituary with a photo of a Toronto member to kwoolridge@actratoronto.com. 10. Will I still receive my printed Performers magazine? We have no immediate plans to entirely discontinue our printed publication. 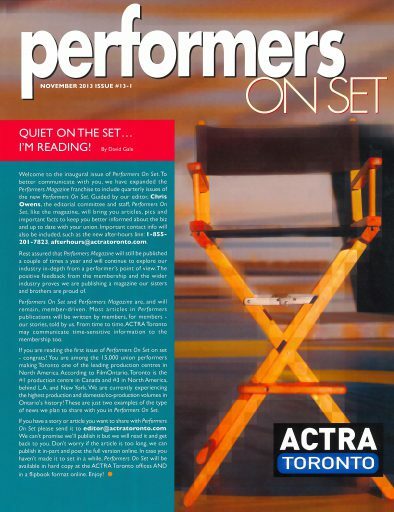 Performers magazine will continue to be printed and mailed to members but perhaps less frequently and Performers on Set, our newsletter, will continue to be printed three to four times yearly and distributed on sets and be available for pick-up at the ACTRA Toronto office. Flipbook versions of our print publications are available to read on our main website: https://goo.gl/k54NoC. It is our goal to populate Performers Online with the same union-relevant journalism that can be found in our printed publications, only more frequently, more dynamically, more interactively, and more environmentally-friendly, while spending less. More for less. I understand old habits die hard and that some people may never be moved to ride in a self-driving car or read an online magazine, but as ACTRA Toronto participates and drives a transition to a more paperless industry, the digital writing may be on the digital wall for all printed material and I can hear the rivers, trees and air rejoicing. 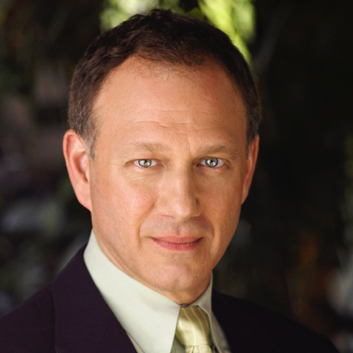 David Gale is the Publisher of Performers Online, Performers magazine, and Performers on Set and the V.P. Communications of ACTRA Toronto.